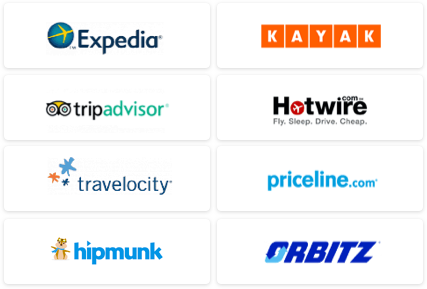 Like televisions out of a window, rock stars and hotels just fit together. From the Mandarin Oriental, Bangkok where Billy Idol caused so much mayhem he had to be shot with tranquilizer darts by the Thai army; to what is now called the Andaz West Hollywood where Led Zeppelin's John Bonham rode a motorcycle through the hallways, and the Holiday Inn, Flint where Keith Moon started a food fight, destroyed a piano, set off fire extinguishers, and drove a car into the swimming pool, many a hotel's walls, if they could talk, would tell stories of rock star excess. 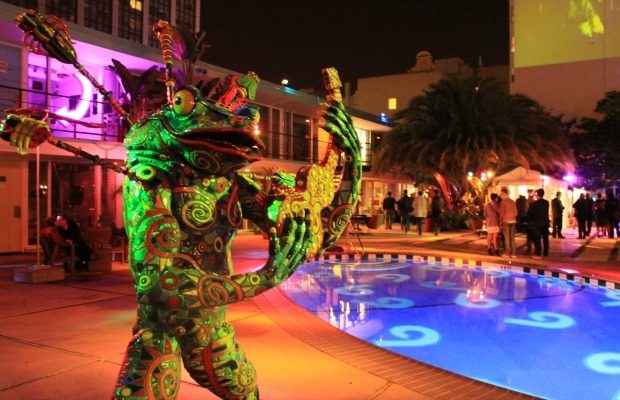 While the trend of high hotel debauchery has faded over time, in spite of Joel Madden and DMX's seeming attempts to revive it, there are a few hotels where you can get a taste of a rock n' roll lifestyle without incurring the cost of "incidentals". Located in the central Leidseplein square, in the heart of Amsterdam's nightlife district, BackStage Hotel is Rock n' Roll all the way to its interior design, which features ceiling lights made from snare drums. The hotel is a few steps from both the Melkweg and Paradiso music venues, and is often the hotel of choice for musicians passing through Amsterdam on tour. 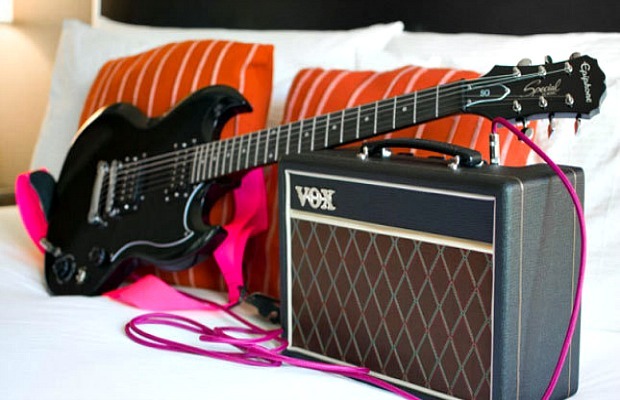 If you find yourself inspired, you can borrow the hotel's guitars and jam some Guitar Hero in the bar. At the Max Hotel in Seattle, you can stay in a recently refurbished fifth floor room that celebrates the musical legacy of Sub Pop, the legendary independent Seattle music label that discovered Nirvana, Mudhoney, and Soundgarden, and turned 25 years old this year. The rooms feature Sub Pop band posters with QR codes allowing guests to scroll through the label’s website and order posters and music online; Crosley record players, label-curated vinyl records, and Sub Pop music videos on the in-room televisions. Additionally, corridors on the Sub Pop floor feature large-scale black and white photographs from Seattle photographer Charles Peterson, who documented Seattle's music scene in the late 80's and 90's and helped define the early Sub Pop aesthetic on the label's record covers for Nirvana and Mudhoney. This motor lodge turned 44-room boutique hotel in San Francisco's Little Saigon, on the fringes of the Tenderloin district, has hosted such guests as David Bowie, Red Hot Chili Peppers, and Pearl Jam. Public spaces and bedrooms have a retro artsy vibe, with pastel colored walls, paintings, courtyard, and mural-bottomed outdoor swimming pool, (one of the few in this chilly city) and pool bar. While the parties have toned down considerably since the hotel was purchased by the Joie de Vivre group, but it's still the place you're most likely to bump into touring musicians. As you can guess from the name, the boutique Hard Days Night Hotel is a tribute to Liverpool's finest: The Beatles. The hotel is located in Liverpool's unofficial "Beatles Quarter," (also known as the "Cavern Quarter") around the corner from the Cavern Club where the Fab Four played almost 300 times. Statues of the John, Paul, George, and Ringo stand in front of the hotel, while a Yellow Submarine-themed jukebox sits in the lobby, and Beatles-inspired artwork adorns the walls. 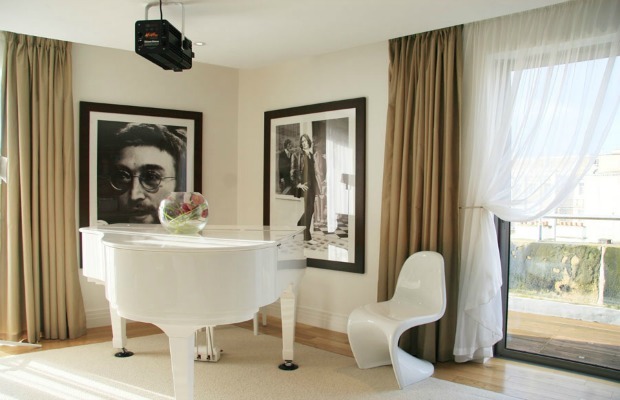 The Lennon Suite comes with a white piano set against a white wall, as in the Imagine video. September weeknight rates start at £110 ($175). As any European under 65 knows, the Balearic island of Ibiza dances to the beat of house, techno, and trance music, so finding a rock hotel here is a little surprising. 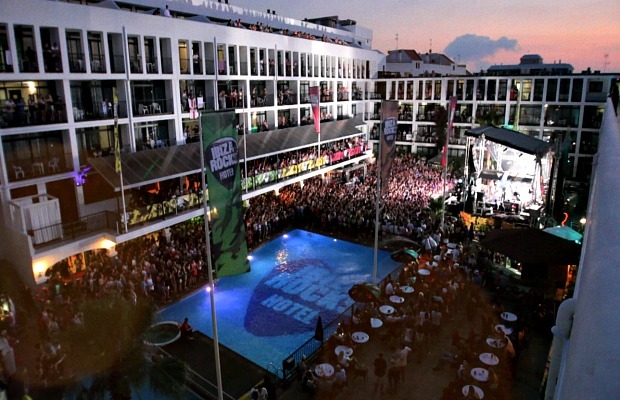 Nevertheless, the hotel's poolside stage has hosted the likes of the Arctic Monkeys and Vampire Weekend, (though the lineup largely skews electronic) as well as numerous after-show parties. The hotel even has its own rehearsal studio, so don't count on getting much sleep. To watch shows without leaving your own room, get a Stage View Studio room with a balcony that overlooks the stage. 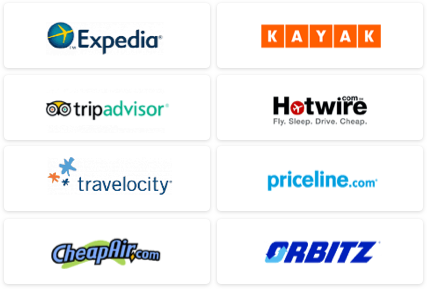 September weeknight rates start at €58 ($77) with a two-night minimum.